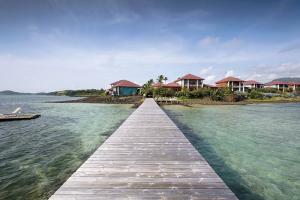 Life is good at this tranquil, all-suite resort nestled on the east coast of Martinique. This little slice of heaven is the only five star Relais & Chateaux Resort of the French Caribbean Islands. Luxury and Executive suites include a small private swimming pool and secluded outdoor shower. All guests enoy a private terrace or verandah, fine dining, a white-sand beach and a variety of activity options. Overlooking a lagoon, on the French island of Martinique. Fort De France airport (FDF) is 16 miles. Morne Courbaril town is 6 miles. Le Belem, Le Campeche, Cohi Bar, and In-Room Dining.